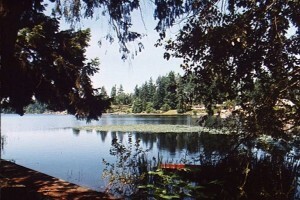 This prime spot is located in the eastern part of Lacey with about 500 feet of shore on Hicks Lake. 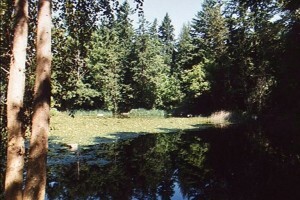 It originally was a Boy Scout and resort camp during the 1940’s and 50’s. It was abandoned in the 1970’s and has never been further developed since then. 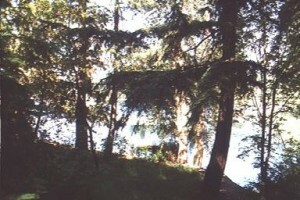 The area is a picturesque place with most of the concrete placements of the resort still intact. 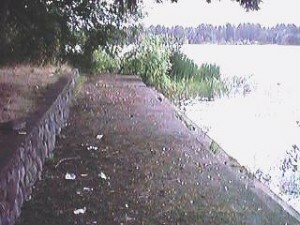 It features a concrete bulk head with steps that go down into the water. It still has the old cabins that were once standing, but now have fallen from abuse and abandonment. It is now used as a community park and party spot by the surrounding neighborhoods. This is one of my most favorite spots as I live within walking distance from it and the peacefulness of Hicks Lake. The property starts at the intersection of Carpenter Road & Shady Lane. Originally there was an opening off of Carpenter Road where you could park several vehicles, however due to garbage dumping and poachers it was blocked off. A good sized 4×4 should be able to make it over the stump and pile of dirt placed in the front entrance, but no car can make it for sure. 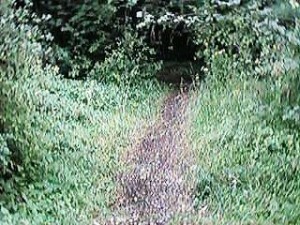 The second entrance is a trail head located off of Shady Lane. There is a spot opposite the trail head for about two cars maximum, but can fit one car no problem. So, because of this you’ll be limited in certain ways. I don’t suggest parking on the shoulder of Carpenter Road as there is really no room and can attract a little more attention than wanted. Update! 6/12/02 – I believe this property or a partial part of the property (on the corner of Shady Lane & Carpenter Rd.) is being sold. At least that’s what I figured the for sale signs are for. The signs state that it is zoned for commercial development. It’s kind of scary. Hope someone doesn’t get the bright idea of building a convenience store there (maybe a donut shop). Update! 11/24/10 – The property was developed I am going to guess around 2003-2004 into 4 parcels of McMansions. The last update I did was in June of 2002. Its been awhile! 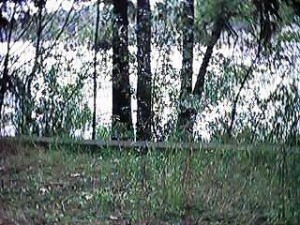 I suspect these are some of the only photos of the camp that are online. I think I will put them up on Flickr as well. The trail head will lead it’s way to the main parking area. The best place for gathering is down the old concrete staircase and out onto the bulkhead where Hick Lake comes right up onto the concrete steps. Be sure to wear some good shoes as there is a good stack of broken glass on the ground from years of people enjoying this great scenic spot. Also watch out for the ants as they love the garbage that was piled up for so many years before they closed it off (most of the garbage was hauled away). This is a good place when you only have a few people out to have fun. The bulk head area which is the prime spot is near a couple residential houses so during the night time hours it is best to keep as quiet as possible. During the day there is not much traffic depending on the weather, but you’ll probably be favored of not being bugged by anyone other than people looking to do the same. There are great areas for picnics and camp fires, though I would frown on any overnight stays because of the insects. 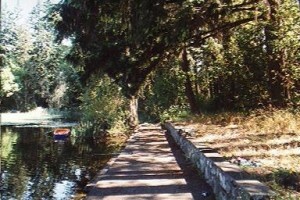 The fishing from shore is great, I’ve caught bass, and sunfish, plus Hicks Lake holds one of the records for the largest trout caught in Thurston County. Update! 11/17/14 – I have discovered a short video clip of one of the large ant hills that was on the property. There were at least two other ant hills that were in similar size as this one. You can’t tell very well in the video clip but the hill was over 4 feet tall. There were no ants visible on the surface.